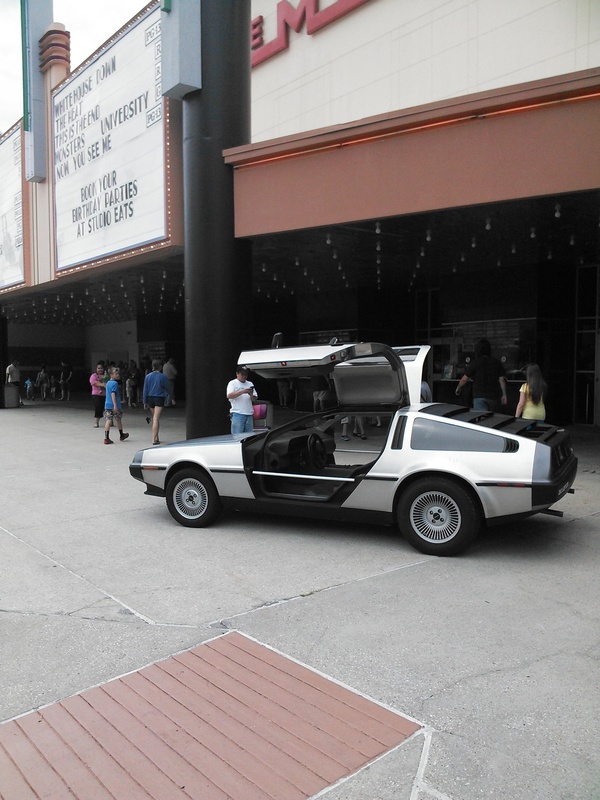 Every year we try to attend as many Back To The Future screenings as possible. 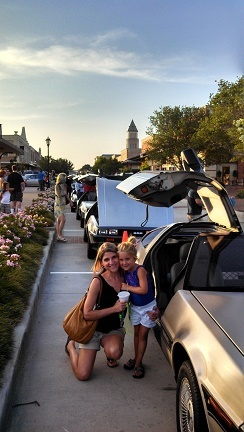 This time the Alamo Drafthouse at Mason Park in Katy sponsored a movie marathon, which included all three of the Back to the Future episodes. Most owners use the winter months as downtime to get work done on their cars. 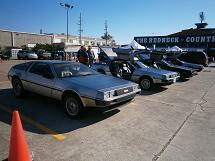 Nevertheless, we had five cars for this BTTF event - Ian, Shannon, Bill and Rose, Brandon, Jeff and Kimberly. Thanks to all who attended. (Click images to enlarge). Driving; Marty McFly himself. 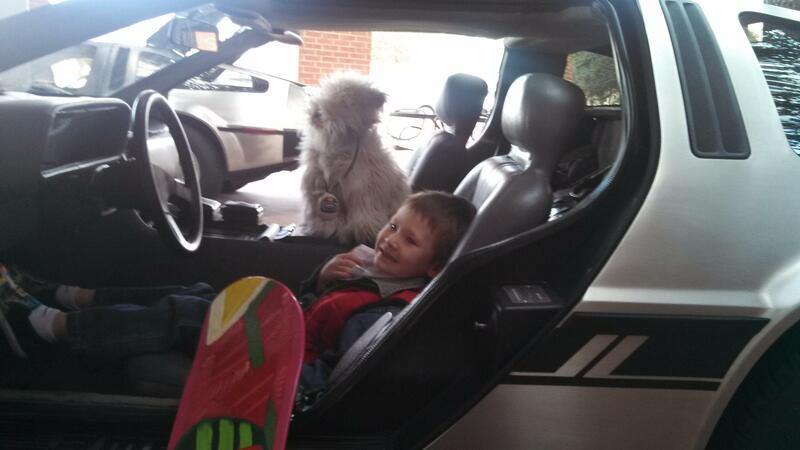 Marty brought a hover board back from the future with him, then went back into the past, and sent his younger self back to the future....um, er, well, you know, whatever. Shotgun; Einstien, the time traveler's faithfull companion. 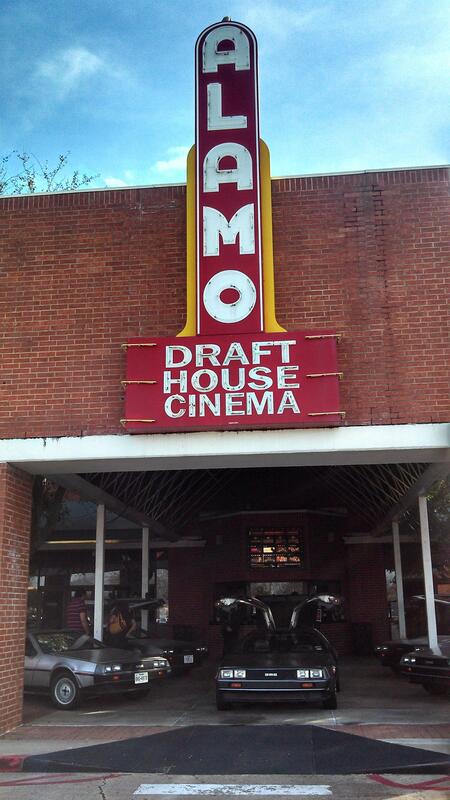 In Brier Garden, ye old Alamo Drafthouse. The iconic cars were neatly placed on display directly in front of the ticket booth One can't help but trip on a DeLorean while trying to buy a ticket. Lots of movie goers came to see the marathon. 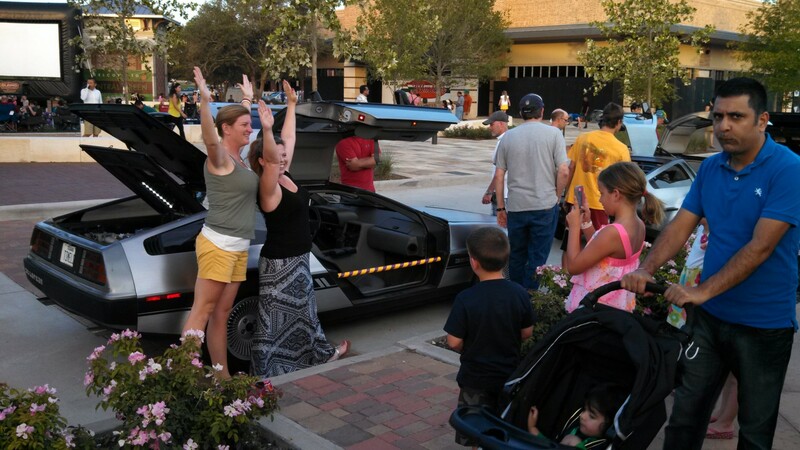 And as usual, real live actual DeLoreans are always a big hit. On Friday, March 22, the Mercury Chamber Orchestra held its annual fundraising gala at the Wortham Theater Center. 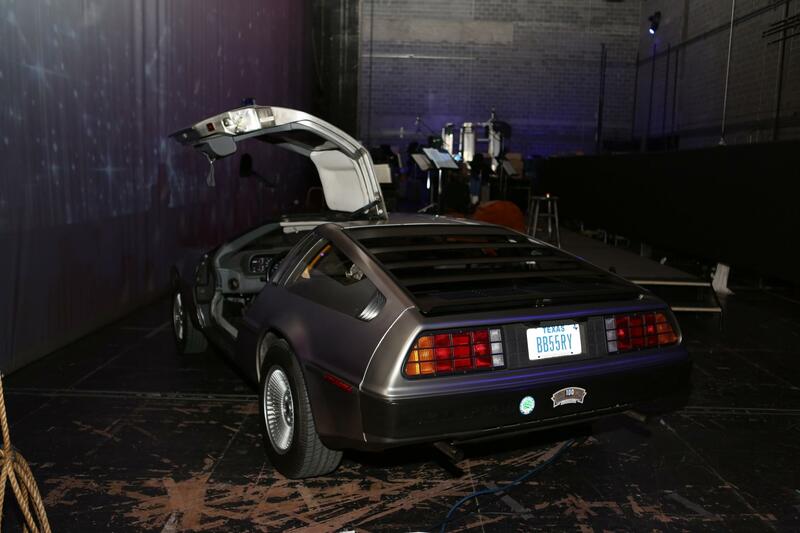 The theme for the evening was "Bach to the Future" and in keeping with that theme, the call went out to our group for a DeLorean to be displayed on stage for the evening - and to play a part in the gala itself. Jordan Witherspoon, Development Director for Mercury, quarterbacked the project and it was a pleasure to work with him. There were many moving parts to the operation. A tow truck was required to lift my DeLorean to the level of the loading dock entrance to the Wortham. We did a dry run with the tow truck Thursday morning, the 21st, then did the actual move into the Wortham backstage Friday morning. An inspector from the Houston Fire Department then arrived (another matter to be coordinated) to ensure compliance with the Department's policy regarding vehicles inside buildings. The gala, a seated dinner with live and silent auctions and held on the stage, began on schedule that evening. 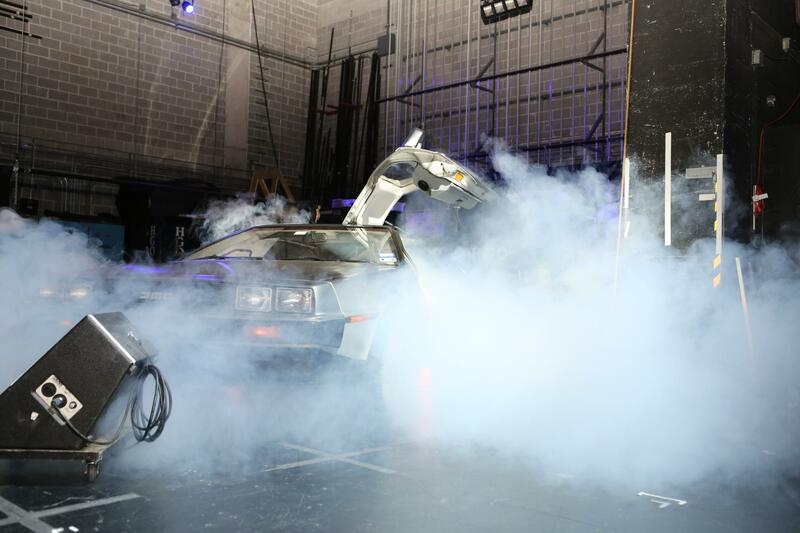 At the appropriate moment, the curtain at the back of the stage rose, and Antoine Plante, Musical Director of Mercury, staggered out of my DeLorean, wearing a lab coat of course [Picture 6], and proceeded to conduct the on-stage orchestra in a short concert. All went exactly as planned. 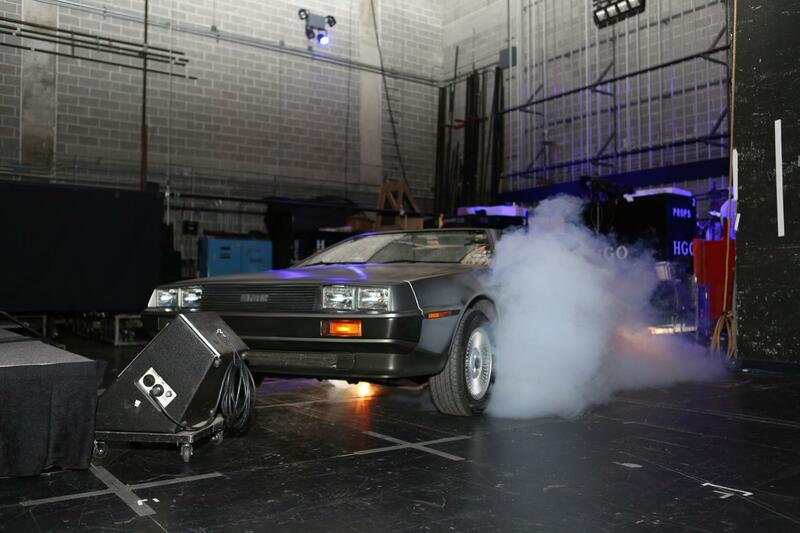 The appearance of the DeLorean in the show was known to only a few persons involved in planning, so the guests did not know of it and were really surprised. The car remained overnight backstage and was retrieved the next morning, again with the aid of the tow truck. It was my pleasure to participate in this small way, all the more so because one of the founding members of Mercury is a former colleague from my days practicing law. An additional and unexpected benefit has been coming to know Mercury and listen to its music. All photos courtesy of Priscilla Dickson (click images to enlarge). 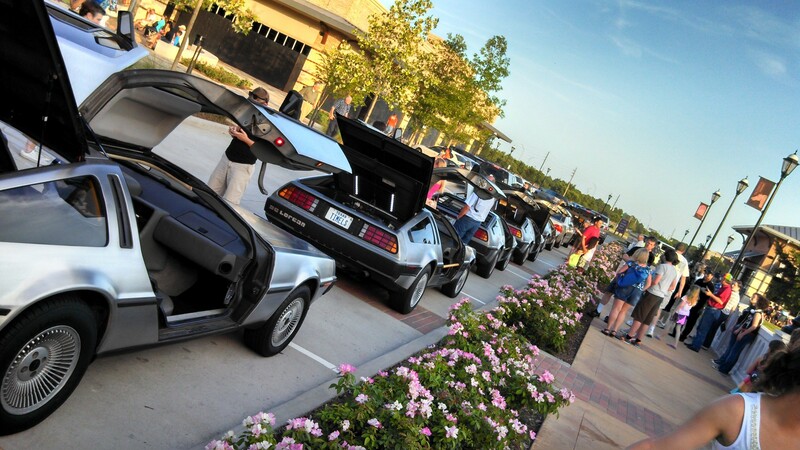 The DeLorean, patiently waiting all day Friday for the big event to begin. 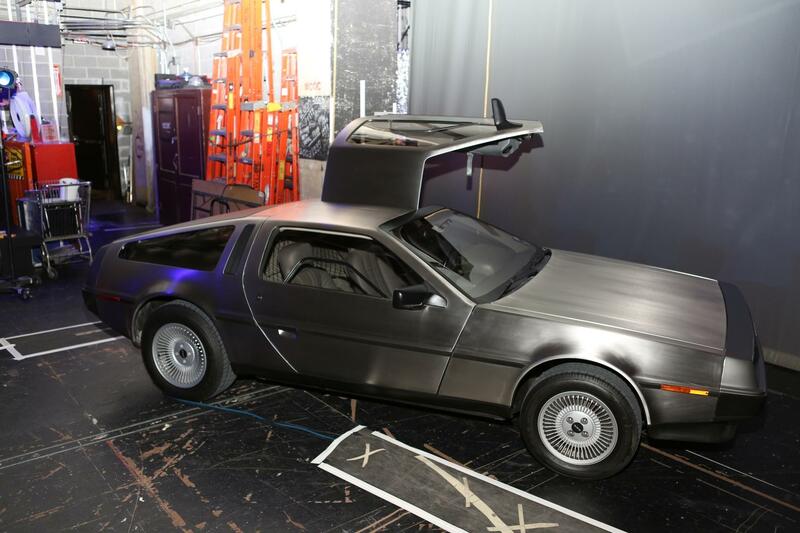 Another picture of Chuck's car backstage in the staging area. Still behind the curtain, smoke (for visual effect) starting. And finally, the car is unveiled. 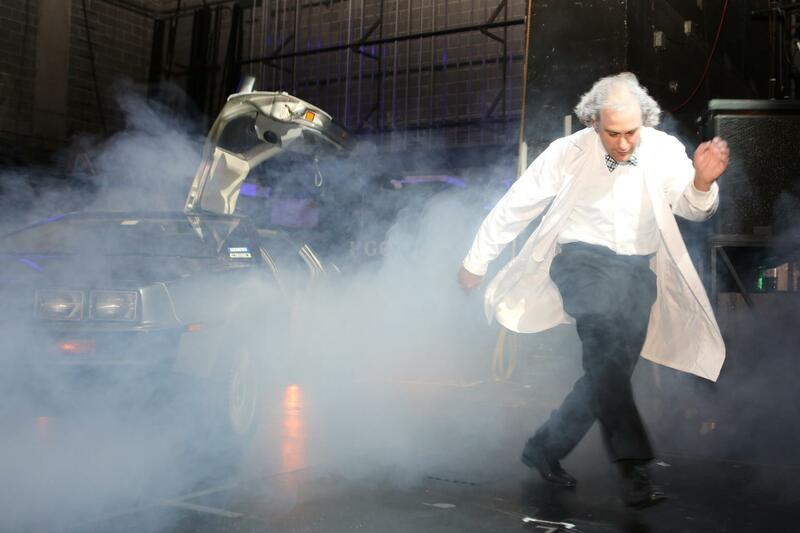 Mercury musical director Antoine Plante, wearing a lab coat, staggers out of Chuck's DeLorean. 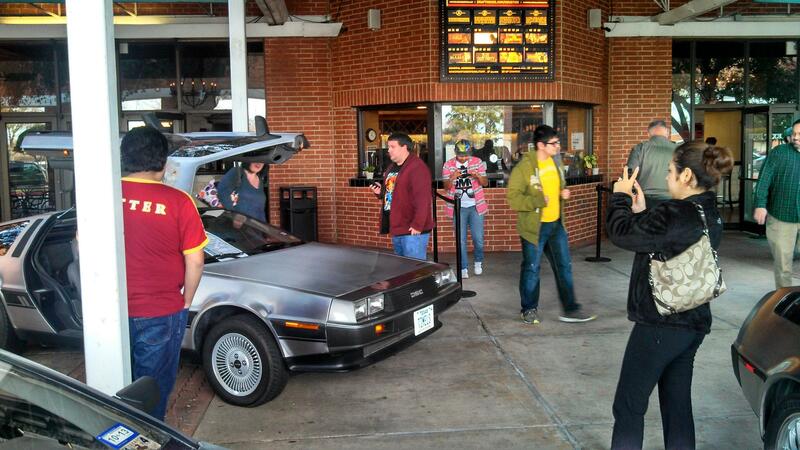 Our second Back To The Future event was again sponsored by Alamo Drafthouse. 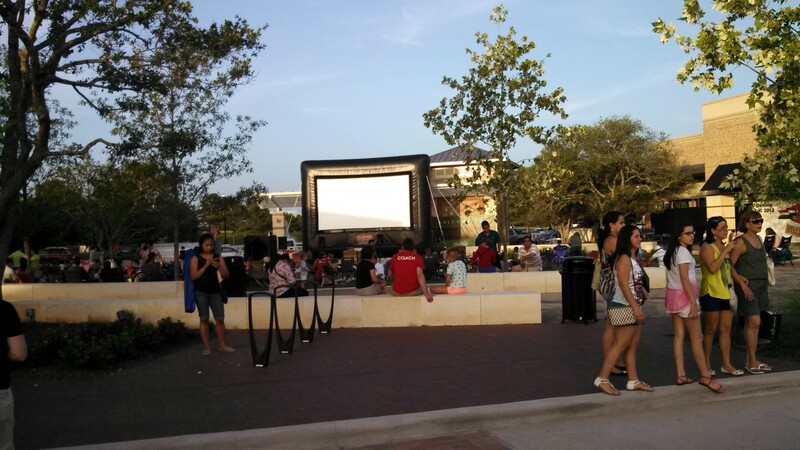 This time, an large air/blow-up screen, and a new venue provided the backdrop for this screening. The lineup included: Ian Yanagisawa, Pete and Donna Lunn, Rusty Key, Jeff Cooke and his wife, Shannon Birdwell, Kimberly and Jeff Terrell. A hug from your daughter: PRICELESS! 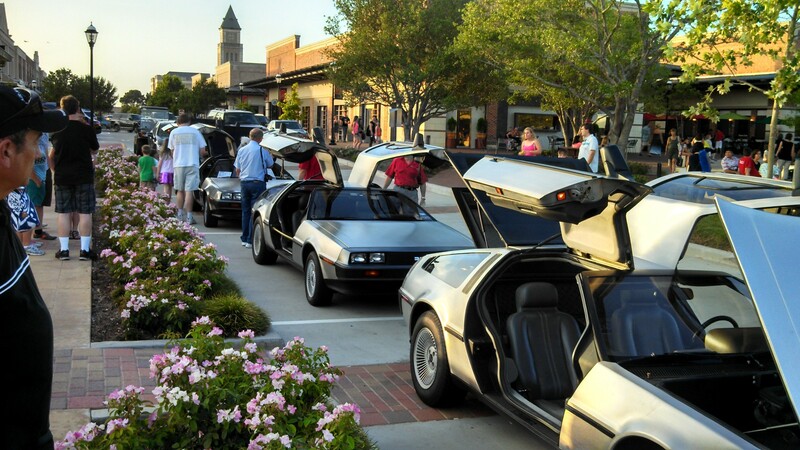 Well before the screening, attendees had a chance to view six of the club's vehicles. 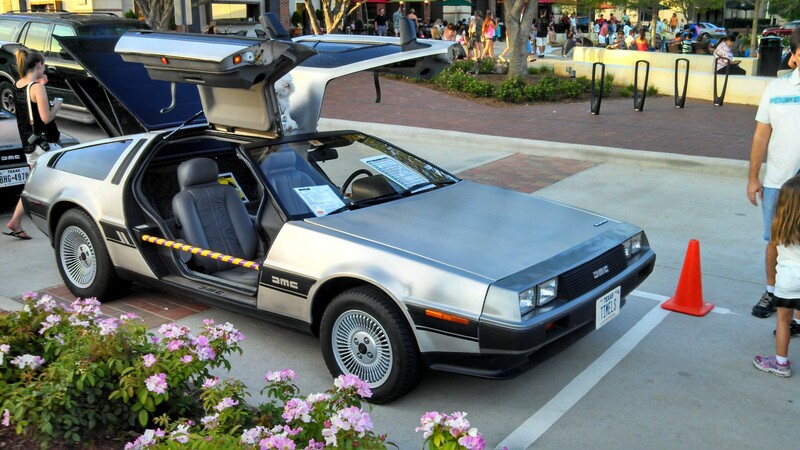 Shannon's timeless car, complete with the DeLorean fact sheet, and radioactive warning signage. A view of the venue before showtime. While some people delight in the possibility of physically having gull-wings and want to express themselves graphically while getting their picture taken, others get pretty perturbed when you include them in your picture without permission. Since we've been attending BTTF showings as a club, all of the showings have been at a single venue, and usually only one showing on one day. Sometimes, a venue would show the complete series of BTTF (I, II & III), and sometimes they would show them on consecutive Friday (nights) and Saturdays. 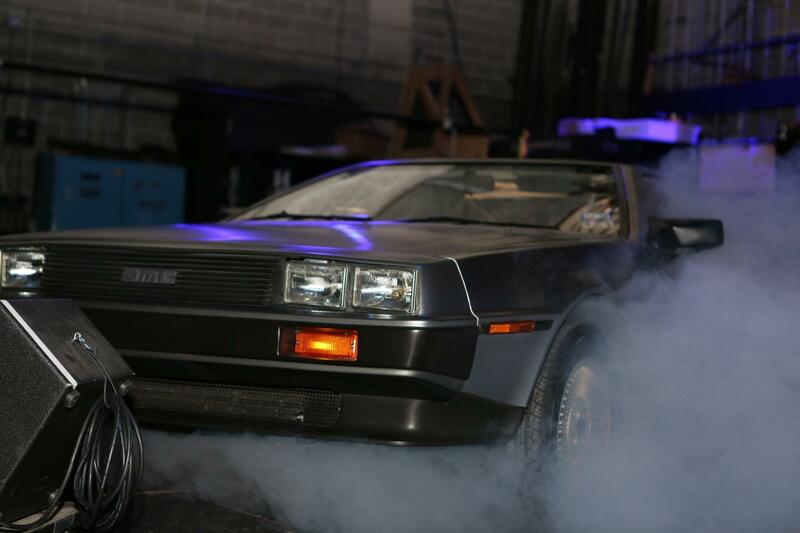 Never before (to our knowledge) has there been a nation wide BTTF event, over the course of several days. 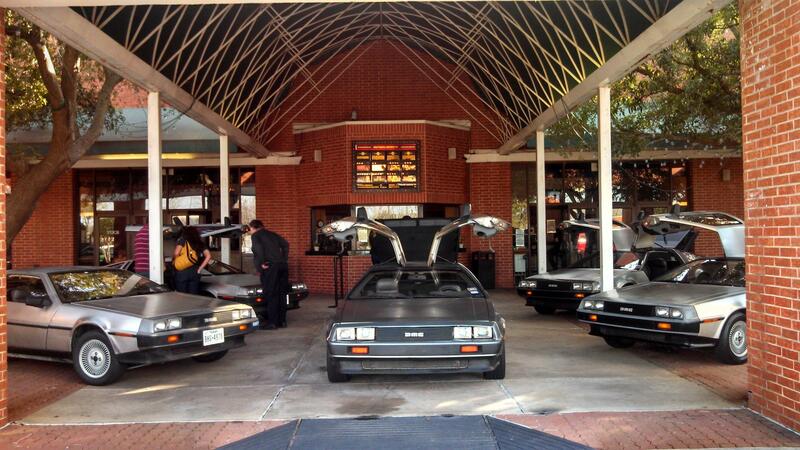 Cinemark has broken the mold for BTTF showings, by announcing and completing a nation wide BTTF showing event. In the Houston metroplex alone, three Cinemark theaters (The Woodlands, Memorial and Webster) screened BTTF part one on Sunday July 14th, and Wednesday, July 17. 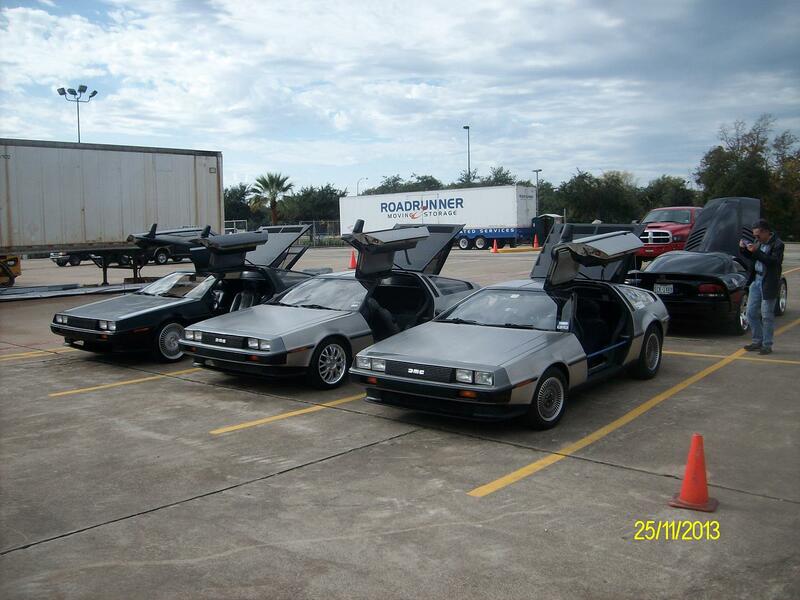 Houston based Texas Delorean Club members attended as their schedules and locales permitted. We had very short notice, so attendance was of course sporadic. Nevertheless, attending these screenings are always enjoyable for both club members and movie patrons. 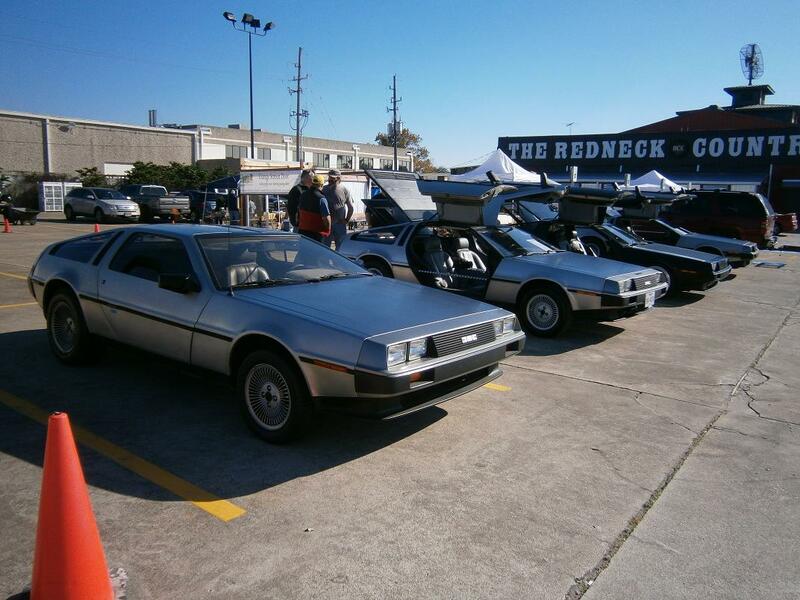 The club received a special invitation from the Redneck Country Club in southwest Houston to show a few cars at their two day weekend Christmas Market event. Cars, a band, a number of flea-market style vendor tables, and a hot plate of BBQ chicken & sausage (for a suggested donation to help the needy) was available. The club sent three cars on Saturday (Brandon & Crystal, and Bill & Rose and Ian), and four cars on Sunday (Thomas, Jeff & Kimberly, Bill & Rose and Pete). This page has been viewed 3323 times.